Why customers leave businesses is a complicated subject. But Hughes raises an interesting point—any reason you can come up with likely falls into one of these four categories. By diving deeper into the causes within each category, you can get a better understanding of why customers leave. And what to do about it. Death is a little heavy and dramatic for an article on customer retention, although it undeniably makes it harder to retain customers. The real lesson from category one is that customers will not always need what you have to offer. There are two major reasons for this. Your business, like all business, mostly serves a small segment of a very large market. You provide excellent service to people in your segment of the market, but other companies offer other solutions that match the needs of other segments. So what happens when your customers leave your market segment? You lose customers. This happens in all industries. A small marketing agency might provide excellent branding and positioning services to growing companies. Then, as those companies grow faster and become international, the services of the marketing agency are no longer a good fit. A young athlete with great swimming talent can learn a lot from her first swim coach. But eventually, as that athlete competes at a higher level, she’s going to want more than the first swim coach can offer. It’s more common to lose customers because they move up-market than down-market. Although the latter can certainly happen, the takeaway is that the customer is no longer served by your segment of the market. When a customer dies, you can no longer sell to them. But death is far from the only way that a customer can exit your market. Customers leave markets for as many reasons as their are industries. An athlete may stop purchasing fitness products due to injury or retirement. An international company may stop using a marketing agency because they hired for their marketing in-house. There’s not much you can do if a customer decides to leave your market. In some cases you may be able to convince them that they can still benefit from your solutions, but this is a tall order—customer winback is difficult when customers exit a market entirely. Pricing is one of the most common adjustments companies make when they start to lose customers. Price can be a major reason why customers leave—and pricing strategy is of course an entire area of study in marketing. At the same time, companies often over-rely on pricing changes to solve problems actually caused by poor customer service or outdated products. If you do have a legitimate pricing problem, dealing with it might take some research. You’ll need to look at your margins and cash flow, industry standards, and the perceived value you are creating with your marketing. If you want to learn more about pricing: Confessions of the Pricing Man: How Price Affects Everything by Hermann Simon is an outstanding read on the subject. Your customers can be happy with your pricing and be in the right segment of your market. If they don’t actually like what you have to offer, they’re going to leave eventually. Offering discounts and slashing prices can keep them around for a while—and in fact a lot of companies start using these tactics when they’re having trouble keeping customers. But if you’re bleeding customers because they don’t like your product or service, price slashing is the beginning of the end. What might make people dislike your product? If your product claims to solve a problem but doesn’t, or solves a problem but requires a lot of work to use, people are more likely to leave. If your product sort of solves their problem, they might stick around—until something better comes along. If your product doesn’t solve their problems at all, you have bad product/market fit. You probably didn’t get customers in the first place. First, be honest in your marketing. Don’t claim to solve problems that you do not, or exaggerate your ability to solve problems that you only sort of solve. Then, in your product development, you need to make sure that you are staying in touch with actual customers and understanding their needs. The classic, constantly recommended read for this is The Lean Startup, by Eric Ries. Customers leave if they think a competitor can solve their problems better than you can. In Scaling Up, Verne Harnish argues that executives should be spending as much as 80% of their time listening to the market. That means listening to end users and potential customers, but it also means staying on top of the overarching trends governing your industry. He even proposes SWT (Strengths, Weaknesses, Trends) as an update to the standard SWOT analysis. Keep tabs on your competitors’ products, services, and marketing so that you don’t lose customers. Your product has stayed the same. The times have changed. It’s a Blockbuster vs. Netflix story. Your product once matched the needs of your customers and market segment, but no longer. The market has changed and your company got left behind. It may not be easy to catch up to the current market. But if you discover that you’ve fallen prey to innovation, it’s crucial to get back on top of your market as quickly as you can. The final reason why customers leave is both common and overlooked. If you don’t give customers an outstanding customer experience, they’re going to become disillusioned with your business. A crucial point—it isn’t enough to provide “good” customer or client service. You need to create great experiences. The reason? In his book Inside the Magic Kingdom, Tom Connellan makes a compelling point about client service. When it comes to how you treat people, your competition is anyone your customers compare you to. I’ve used Comcast as my internet provider for the last 3 years, and if you asked me objectively I’d have to say that their customer service has improved. But I naturally compare that service to the support I get for other products and services—so it still feels like they’re coming up short. The same goes for your business. Your customers will compare their customer service experience with you to the experience they have with every other company they use. Why might customers be unhappy? If you make it hard to get support, you’re going to wind up with frustrated customers. Think about it. What’s the only thing you want while you’re having a problem? You want the problem to go away. The longer it takes for that to happen, the more frustrated you’re going to get. If you bury your customer service forms, make yourself unavailable for help, or take a long time to resolve problems, your customers are going to get frustrated with you—and may eventually leave. People are smart. They can tell when you’re paying them lip service without actually caring about them. Customers want to know that you care about them. In Authenticity: What Customers Really Want, James Gilmore and B. Joseph Pine II argue that authenticity in marketing and business is what modern consumers crave. People crave connection and personality. They want to connect to your larger purpose (the premise of Start With Why, by Simon Sinek). They want to feel understood when they have a problem. In your customer and client service, strive to be authentic. Have a personality. Listen to your customers problems before you act. You can solve customers’ problems and still leave them with a bad taste in their mouths. Unfortunately, as far as customer service factors go, that bad taste is often overlooked. This is closely related to the idea of presenting authenticity and caring about your customers. It’s not enough to solve a customer problem—the customer needs to feel like you are solving their problem. In other words, your customers don’t just want you to solve their problems. They want to feel heard. One way that companies can go wrong is by falling prey to the Four Horsemen of the Apocalypse. This term was borrowed by relationship researcher John Gottman to describe the four behaviors that predict doom for a relationship. And even though Gottman mostly studies romantic relationships, the same principles apply to customer relationships. Don’t criticize your customers. Don’t talk down to your customers. Don’t act defensive when your customers criticize you. And certainly don’t stonewall or ignore your customers. Does this sound obvious? Good. It is obvious. At the same time, it’s easy to slip into a pattern of defensiveness or contempt—and crucial to train your salespeople and customer service reps to create a great customer experience. If the other reasons for losing customers don’t seem to apply to your business, it’s worth listening to see if you hear the hoofbeats of the Four Horsemen. What happens when you provide great service? Your customer like you. They stick around. They refer their friends. And even if you can’t solve your problem in the moment, they feel heard and don’t feel frustrated by the experience. If you’re losing customers and you aren’t sure why, there might be a deeper question you need to ask. When you understand who your customers are, what they want, and what they struggle with, it becomes a lot easier to see why customers are leaving your business. Companies with outstanding customer service and retention are only able to have that outstanding service and retention because they really understand their customers’ problems. Before I lose you—this isn’t hand-wavy mumbo-jumbo. And if you think you know your customers well enough, you probably don’t (you can never do enough customer research). You can see the impact of great customer research immediately. On a website, it can cause a 400% increase in clicks or conversions (as shown in one of the articles below). In customer service, chat gets rated more positively. NPS scores increase. You can measure the effects of knowing your customers. 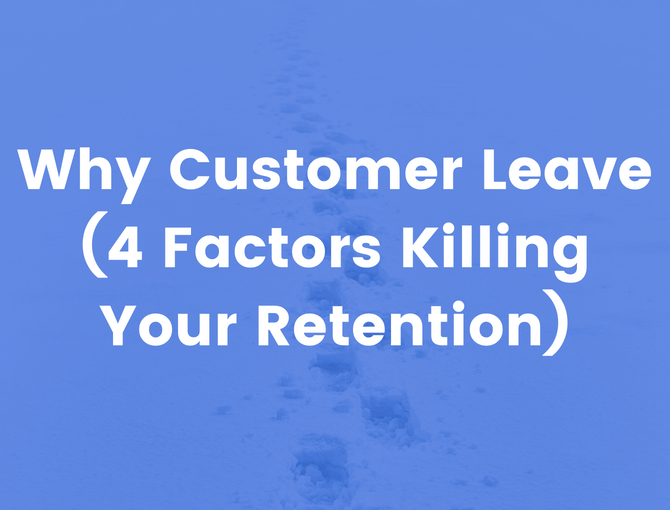 These are the four reasons customers leave. Customers leave because they don’t need your product. Because your product is too expensive. Because your product doesn’t solve their problems. Because they don’t like you. These four categories are broad enough that they encompass every element of the customer experience. At the same time, they are specific enough that they can help you take a critical look at your business. To understand why customers leave—and how you can create an outstanding customer experience.